It was the stuff of movies. Filmed and produced by the Wootton video crew. Scene One: "A Ton of Guys"
Lockett of Poolesville High School led the field for much of the race, but the field did not let the star runners get away. As runners traversed the winding paved trail along the south edge of the park about seven minutes into the race, runners began to string out. Richard Montgomery's Mark Unger led the way briefly. A minute later as runners returned to wide open dirt and grass adjacent to the City of Gaithersburg Water Park, the lead pack was as jumbled as ever with nine guys practically touching elbows. Lockett: "I actually led for a little bit which I wasn't planning on doing, but I just wanted to see if people were tired or not and if I could pull away. But yeah, everyone wanted to lead. There were so many people that I was like, 'Oh, wow, well, he's still up here, and oh, he's still up here.' So I knew that coming down the last stretch that it was going to be a ton of guys." Scene Two: "A Lot of Lead Changes"
Nakasaka: "I expected Ryan and Mark and Garrett to be up there with me, but I didn't expect Obsaa and the Albert Einstein boys to be up there. So they kind of pushed it a bit, and whenever I tried to pass them they sped up a bit more so it was really increasing the pace and helping our times overall. Yeah, there were a lot of lead changes, but I knew to just be patient and go when I knew I had to." 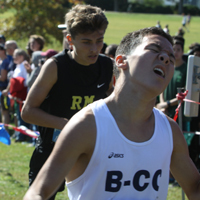 Nakasaka of B-CC High School said that he stayed back in sixth or seventh place for the first two miles, and it was only in the final mile that he started to throw in surges. The pack finally started to string out in the final mile, but it was not necessarily the order that anyone expected. Approaching the pond for the third and final time with about a half mile remaining, Nakasaka said, "It was Obsaa and then Mark, Ryan, and me. Right when we passed it [the pond], I just threw in a surge immediately. Ryan just kind of stayed on my left shoulder." Nakasaka gained the lead for the first time, but his lead was short-lived. Feda regained the lead a second time with approximately 200 meters remaining in the race. Scene Three: "I Thought They Were Going to Push the Pace"
Feda: "I thought they were going to push the pace, so I was just trying to stay and try and make a move at the end. But they didn't push the pace, so I was just like, 'I don't know what to do.'" 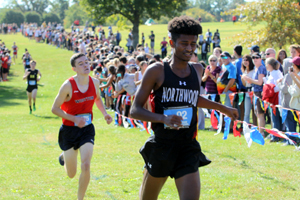 One of the least experienced racers in the lead pack, Feda of Northwood High School thought the early pace was more than manageable, but he admitted that he feared some of the more accomplished runners who he had not seen yet this season. "So my coach was telling me to push the pace after the two mile mark, but I was a little bit scared because I know Adam was good, Ryan, Mark. So I was just trying to stay with them so I don't know what to do. Then my coach came to me [with about a half mile to go]. He told me, 'What are you doing? Just pick up the pace.' So I don't have any choice. I just picked up the pace little by little." Feda took over the race in the final half mile, relinquished the lead briefly to Nakasaka, and regained the lead again. He says that he was cut off at the sharp turn at the flag with about 200 meters to go. Lockett, Nakasaka, and Unger outkicked Feda down the stretch. Scene Four: "A Burst of Speed"
Lockett: "Obsaa, that last half mile: he was killing it! And I didn't expect that at all...Obviously, I knew who he was. He had a good last race, but yeah I didn't expect him to be up there." "And then Adam kicked it for once. I never expect him to all of a sudden just have a burst of speed, but today he did...Me, Adam and Obsaa, we were up there...I knew that all of us three were kicking really hard, and then all of a sudden Adam had a burst of speed." Scene Five: "Gutting it Out"
Nakasaka: "Right when we were getting up to that final flag to turn into the straightaway [with approximately 200-meters remaining], Obsaa pushed it a bit. Immediately after that, I knew I had to go, so I started sticking my nose in it and just gutting it out the entire way. I thought I was doing pretty well in that final stretch and then about halfway through...halfway down the stretch I saw Ryan's shadow so I picked it up a bit more but he eventually passed me and won." In the flurry, Richard Montgomery's Mark Unger passed Feda and nearly caught Nakasaka. Five boys broke 15:40 and ran within eight seconds of each other. Nine boys broke 16 minutes. Scene Six: "Not Usually Like This"
Lockett: "It was awesome. I mean, Counties isn't usually like this. Usually, it's one guy who goes out or it's two guys. But this year it was a huge pack of people. I looked at previous county results and I'm not sure how many people broke 16 or if there is a record for that, but I'm sure a ton of guys broke 16 today. Montgomery County is really killing this season. I'm so proud of everyone. I'm cool with all them. They're all my friends, and I mean, MoCo is the best. It's an awesome running community. My favorite races are counties." Scene Seven: "They Believed in Themselves"
Whitman High School had a bad omen to start the season. 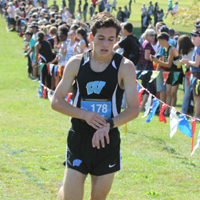 One of the team's top runners and leaders, Joshua Engels, broke his femur and was ruled out from competing during his senior season of cross country. Head Coach Steve Hays said that Engels was instrumental in organizing the team runs every day throughout the summer prior to his injury. Said Hays, "We just talked about, 'everybody's got to step up.' We knew that we wouldn't have him the rest of the season and that just meant that everybody had to be a little better. I felt like throughout the season, they kept doing that. They kept getting a little bit better." When it came down to the county championship meet, the Vikings felt that they were as good as anybody. Said Hays, "We felt that it was really up for grabs and that it could be anybody, and that if we did what we were capable of doing, we thought we could do it. These boys have worked really hard together throughout the summer and the fall. I'm just so proud of them. They believed in themselves and they did it." 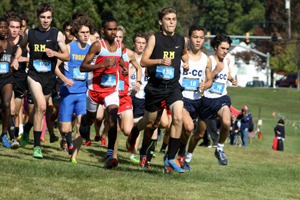 Despite only having one runner in the top twenty (Aaron Bratt in seventh), Whitman crammed its number two through five runners between positions 22 and 35. Whitman's winning score was 123. The top five teams all finished within 30 points of Whitman. For those keeping score, the Whitman boys have now won 14 of the 36 scored county championship meets since 1978. Can you do the county firsts again for this meet? 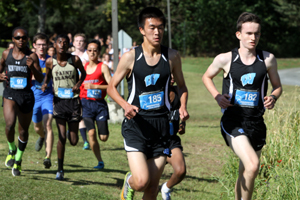 Kevin, This is one of the best articles to appear on MoCo Running. You should submit it to other outlets. Thank you for the great coverage. Great article! Really enjoyed it! It seems extremely fast to me as well, but I would say a few things. 1. Last year was windy. 2. Last year was a one-man time trial. 3. Last year, the varsity races were first before all JV races. More dew was on the ground. 4. The grass is cut at different times every year. Could all of these things combined lead to the faster times by 10-20 seconds? Times were slower on the whole in 2014 and 2016. Times were faster in 2015 and 2017. I forgot who most of those kids are. Are any of them running D-1? 2017 field has way more D-1 talent but some may be sophomores and juniors right now. Whoa whoa whoa, gentleman and ladies, there is an easy way to settle this. Were the girls varsity and boys and girls junior varsity also 10-20 seconds faster than normal? If so, then let's chalk this up to good weather and course conditions. In other news, who cares??? Nobody is winning a scholarship off of this race. The girl's times weren't especially fast this year. In fact, Green was 10 seconds slower this year than last. I actually had the pleasure of working with Abebe (15:50) and Feda (15:38). Both had run 9:44 and 4:33-34 in the outdoor season prior to running sub 16. As far as training, Feda is definitely in better shape than Abebe was so I'm not surprised with the times this year. Top 5 varsity boys have all either run sub 9:50 or sub 4:30, high quality field. Did notice some of the back end guys in the video slightly cutting the course by the pavement, not sure how much time that would add on though. Re: 4a north I've been running, covering and coaching in 4A north for a while now and I've run into questions like this many times. Baltimore City runs a bunch of league meets throughout the season, not unlike Moco. They just usually don't upload the results to athletic.net. 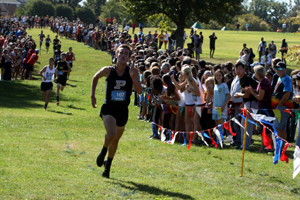 Some of the results are up on Milesplit. Re: 4A North Looks like they only ran two or three guys at the Baltimore City Championships. Regionals could be different but if they don't run five at regionals then, yeah, only five teams qualify (bc Western is also an all-girls school). That means you've probably got Dulaney and Howard, then Northwood, Blair, PB, Sherwood, Springbrook and Catonsville all fighting for three spots. Should be a good one! Ive seen the entries for 4A North - Mervo has entered 5 boys into the race. Doesn't matter now if 5 show up. 6 teams will qualify for states. With the addition of Urbana, Blair, and Northwood, Along with typical strong schools like Dulaney, Howard, and Paint Branch, 4A North is one of the better regions in the State now. Should be a great race for both genders.